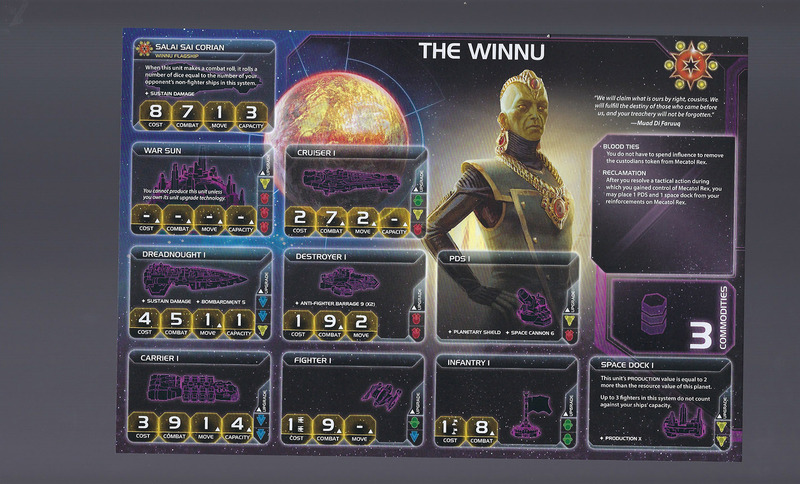 Twilight Imperium is a boardgame of galactic empire-building on a large scale, often described as a 4X game given physical form. 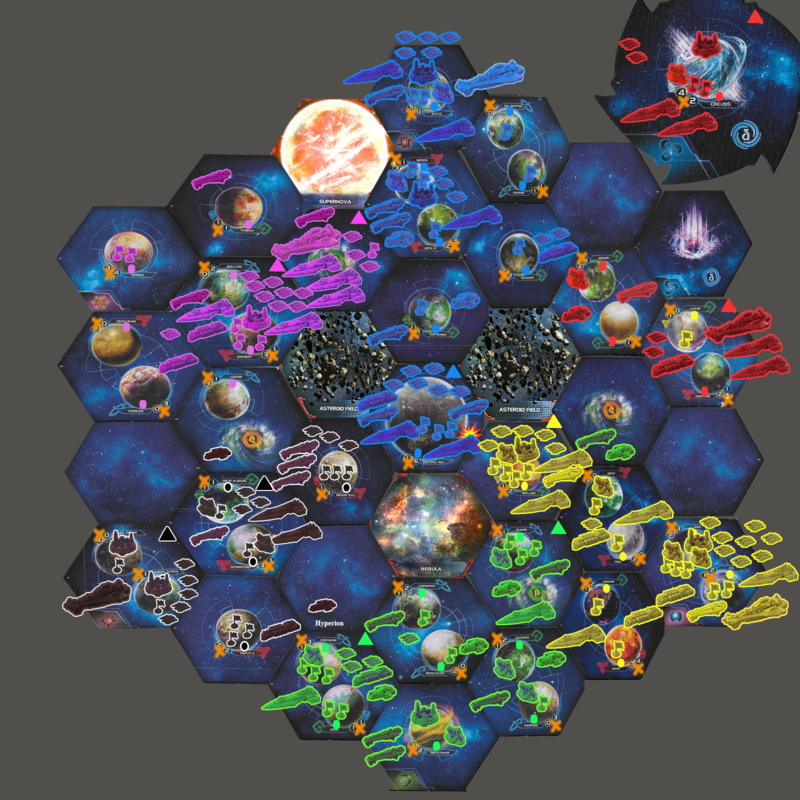 Players build ships, conquer planets, research technology, and engage in trade and diplomacy, all in the pursuit of earning victory points toward claiming the Imperial Throne of Mecatol Rex and rule over the entire galaxy. For this game, we will be using the Shattered Empire expansion with its replacement strategy cards along with the optional rules Custodians, Tactical Retreat, and Racial Techs. Players may post actions in bold using their race's color. Except for conversations between teammates and those initiated by the host, all inter-player conversation must be done in-thread. 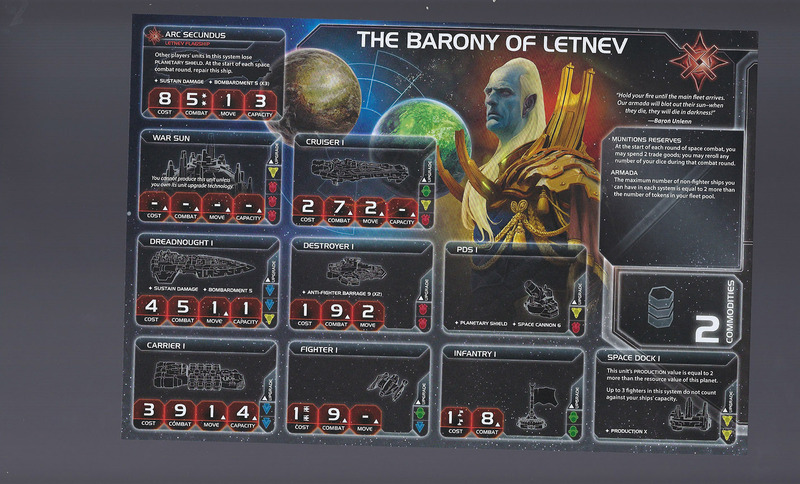 In order to claim the Imperial Throne of Mecatol Rex, players must accumulate 10 victory points (VP). VP are earned by fulfilling Objective cards: at the start of the game, each player has a hidden Secret Objective that only they may fulfill; over the course of the game, cards will be revealed from the Public Objective line that all players may fulfill. As soon as any player has completed 10 VP worth of Objectives, the game ends immediately, even if another player could have gained more VP later in the round. The game is played over a number of rounds. Each round is divided into three parts: the Strategy Phase, the Action Phase, and the Status Phase. In the Strategy Phase, players select Strategy Cards: this determines the special action that player may take during the round as well as play order. 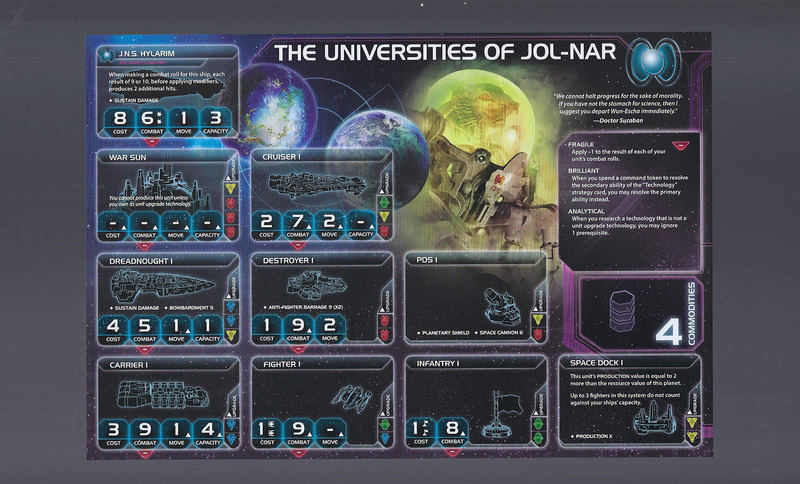 The bulk of activity takes place in the Action Phase: here players may deploy abilities specified by their choice of Strategy Card, activate systems for unit movement, space combat, invasion of planets, and building of new units, or to play certain action cards. 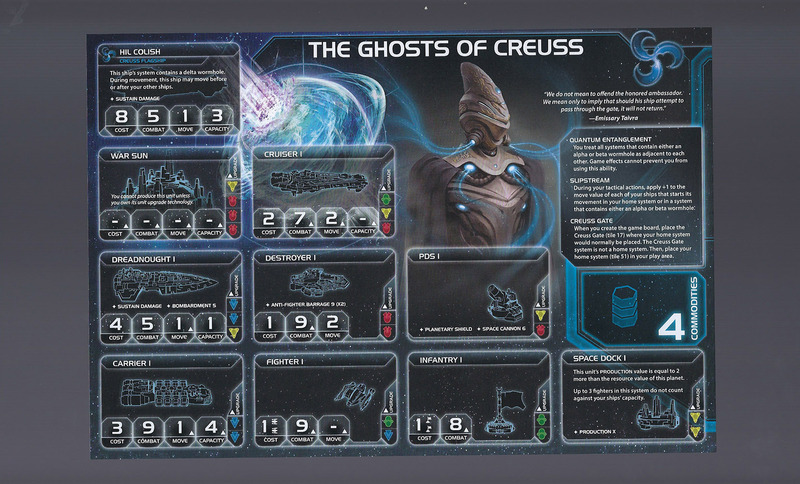 Once everybody has passed their turns in the Action Phase, the Status Phase allows for players to score victory points by claiming objectives and refreshes the board setup for the next round of play. In the Strategy Phase, players select Strategy Cards for the round. Each Strategy Card has a special ability and determines play order in the Action Phase. Starting from the player with the Speaker token and moving clockwise, each player will choose a card; each card may be selected by at most one player. Starting with the player with the lowest-numbered Strategy Card and moving up in number, players take actions sequentially until all players have passed. A "round" is a complete runthrough of all the phases (strategy, action, political agenda, cleanup, etc) while a "turn" is one player's action during the action phase. Pass- Signal you are done with the action phase. You can no longer do anything for the rest of that round's action phase except play off of the secondary actions of other players' strategy cards. You cannot pass until after you've played your own strategy card. Play your Strategy Card- Perform the primary action listed on the top half of your strategy card that you chose during the strategy phase. After you do this, everyone goes around the table opting whether or not to perform the secondary action on the bottom of your strategy card (usually a weaker version of the primary). Choosing to perform a secondary usually costs one command token from your strategic action pool. Tactical Action- Take a command counter from your tactical pool and place it in a system to "activate" it. Any unit that may legally do so may move into that system (units have to end their movement in the activated system). Combat takes place if any. 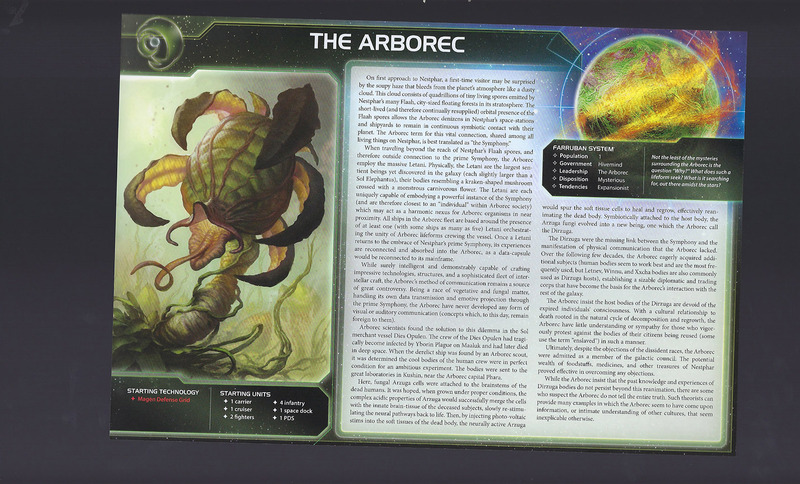 You may then build units off of one or more of your space docks in the system. Once a system has one of your command tokens on it, you may not activated it again for the rest of the round. Seriously, read over the first section of the Google doc. There is no more tech tree. 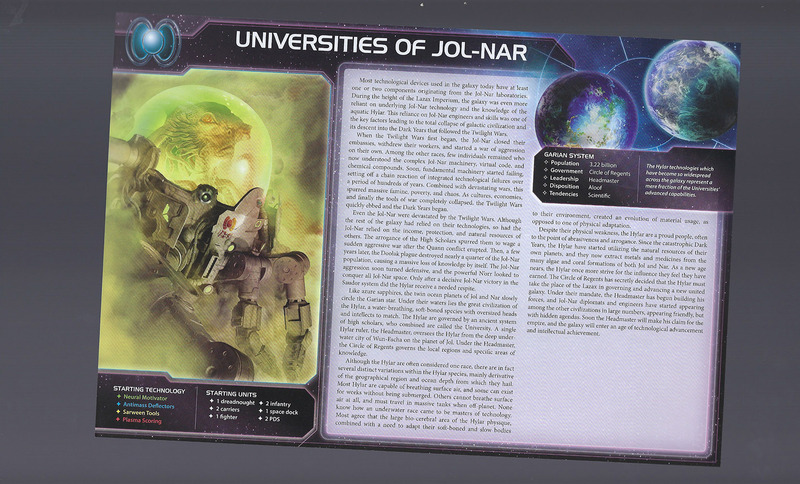 All tech cards have color prerequisites printed in the bottom left. You may only research a tech if you have already researched the number and color of the symbols in the bottom left. Most unit related techs have been consolidated into separate techs, or "Mark II" versions of units. Mecatol Rex custodians are now "defeated" by simply spending 6 influence. There is no other way to remove them. First player to land on Mecatol Rex receives 1 VP. Further VP can be gained by controlling Mecatol Rex and choosing a specific strategy card. These VP are separate from objectives and available to everyone. Political Agenda voting begins as soon as someone takes Mecatol Rex and happens automatically at the end of every round. Space Docks can only be built by the Construction strategy card. Secret Objectives are only worth 1 VP each. 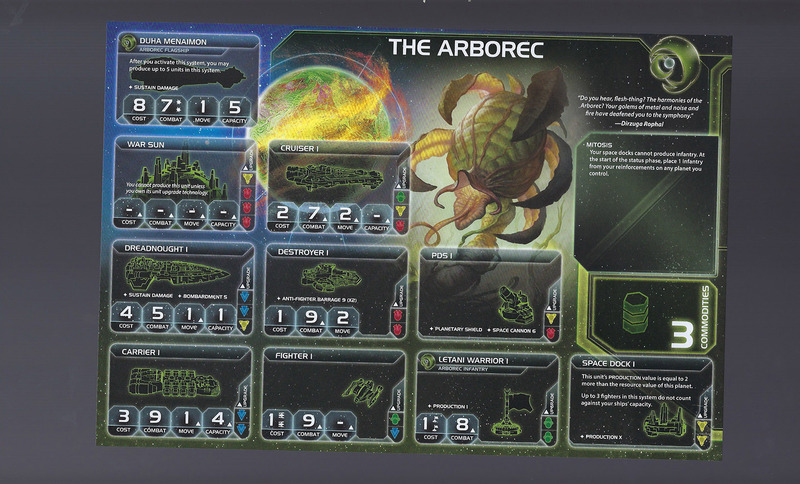 Each player may draw new objectives with a certain strategy card. Players may have a total of 3 claimed or unclaimed secret objectives at any time, for a possible 3 VP from secret objectives. 2. You may only make one transaction per player per "table pass" (from your action turn until it comes back around to your action turn again). Although holding lots of planets with lots of units and lots of resources helps, ultimately all that matter in the end is victory points. Try to ask yourself "how will this help me score an objective?" with every action you take. One of the most powerful abilities you can get is an infantry carrying unit faster than 1 movement. This can be upgraded carriers, cruisers, dreadnoughts, or war suns. Also certain action cards let you move faster. Don't forget that the Warfare strategy card primary ability essentially lets you move units twice in a round. Bear with me, this is going to be clunky at first with the new edition. Trying to scrub out all out of date references to the 3rd edition from the stock OP. Feel free to point out anything that needs correcting, both at the start AND during the game since this is my first time experiencing the 4th edition as well! Won't be posting direct images of the new techs and races until the game has started, although they are all available in the OP linked Google doc. Game will be 6 players (4th edition currently does not support 8). There are 5 free slots with 1 slot reserved for Mr. Blarney since he will be hosting a 2nd game. I was planning on going random races for everyone since all "tiers" have (theoretically) been reset from TI3 and we're all brand new babes handling them. This could possibly change (or allow players to swap after random assignments). Oh man, this is really tempting. I haven't played TI in years so i probably forgot all the rules. The "Learn to Play" pdf is surprisingly simple to follow. They really did a good job cleaning up how to learn the game. I'm certainly interested in this. I have no idea how this game works (thats not true, I spent half the week watching videos during lunch) but I would still like to give it a try, and probably lose. I've never played a (complete) game of TI before. As much as I love TI3, I haven't played it in years. Gonna be so rusty. Don't know how to play, so I'll just watch this round and hopefully learn so I can join in next time. Excited to see it happen though! I've never played before; is it okay for a complete newbie to play? I'm a noob as well. 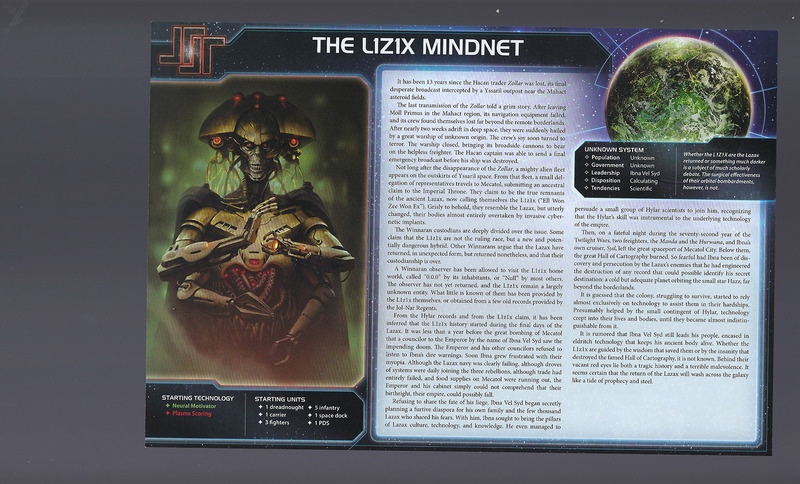 Total newb to Twilight Imperium or just the 4th edition? I'm fine with either. I strongly strongly recommend reading the "Learn to Play" link though. I'm updating the OP with a very basic turn overview. 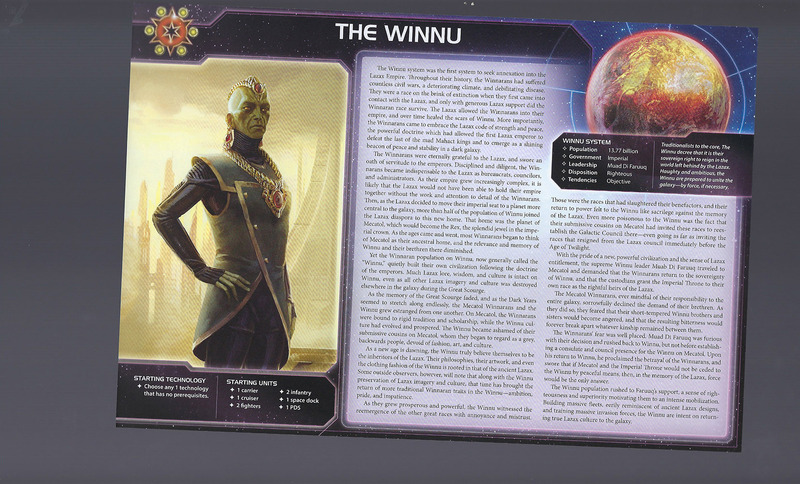 I mean, never played Twilight Imperium at all. If it's cool, I'll definitely read the directions / watch how-to-plays before we start. I'll just watch this one, rooting for whoever ends up as Xxcha. Looks like Xxcha got some badly needed buffs. Racial techs can cancel any strategy cards and block tactical actions to their systems after the other player has spent and placed the command token, meaning they waste the token and are locked out of that system for the rest of the round. Their flagship is pretty kickass too. 3 range 1 space cannon shots! pew pew pew! As noted by MrBody, I will be hosting a second game (hopefully over the next weekend or two) so anyone who doesn't make it into this one will have priority in mine. Oh, yeah - Sign up! 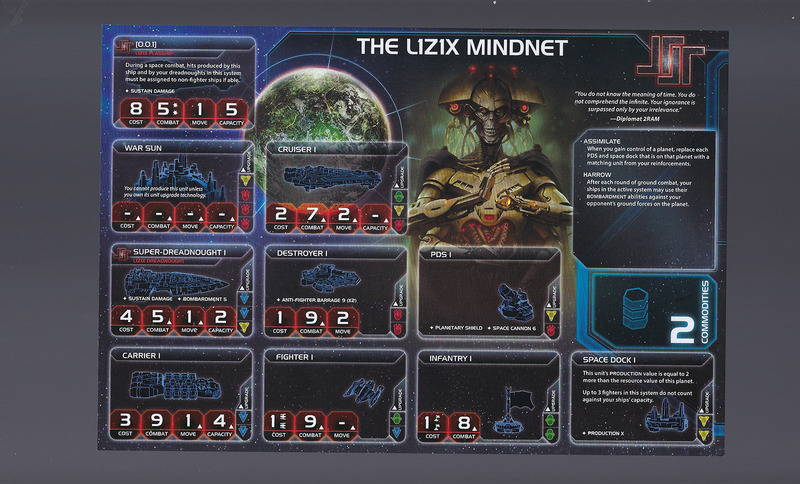 I've updated the action phase section to try and give a clearer picture of the very basics of Twilight Imperium. The game is divided into "rounds", which are divided into "phases". The 2 big phases are "strategy phase" and "action phase". Strategy phase everyone, in order, selects one of the 8 strategy cards. Then we go to the action phase. -activates a system to move units into it, fight any combat, then build units if able. -Exhaust your strategy card to perform the primary (top) action. Then, in order, everyone gets to decide if they want to perform the secondary (bottom) action on your card (usually a weaker version of the primary). -Pass, to signal that you are done with the action phase. Your turns will be skipped for the rest of the phase. You can continue to act on the secondaries of other player's using their action cards but that's it. You cannot pass if you have yet to play your strategy card. That's the bare basics and 90% of the game right there. There are other actions.  Some race abilities, action cards, or techs will say "Action" to denote that it takes up one of your action turns to play. General advice is to remember that it's ultimately all about victory points, not total power like a typical 4X game. While getting more planets and units certainly helps, in the end all that matter is victory points. All actions you take should ultimately be with the goal in mind to score objectives. I will throw my hat into the space ring. Sign. Who shall be the final 5? are in. Everyone else can join Blarney's game. As the person with the highest entry roll, I am primed to come in dead last in the actual game. Fear, enemies, for I am limping after you! Eventually! Given the majority of new players, I'm going to disallow race choosing and swapping. Don't want those shady veterans to pull a fast one on newbies. I think I've got this right, but - a carrier starts in my home system ("off-board," or at least off the main map). It gets +1 movement from my Slipstream ability. I move that ship through my Delta wormhole to the Creuss Gate system (1 move) and can then move it into an adjacent tile (2 moves). ED: If the carrier is starting in the Creuss Gate system, it's "not a home system", so it has a movement of 1. I'm reading that properly, right? 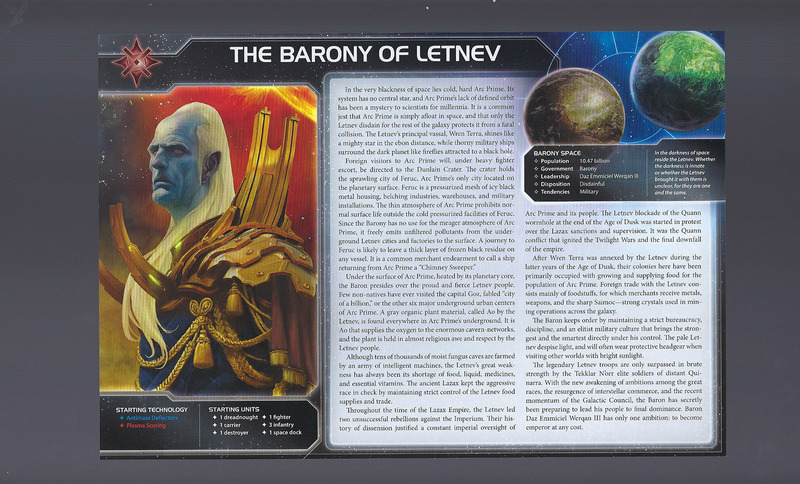 I look forward to the day when you all swear fealty to the Baron of Letnev. Or watching the smoke rise as your planets burn. That's correct. 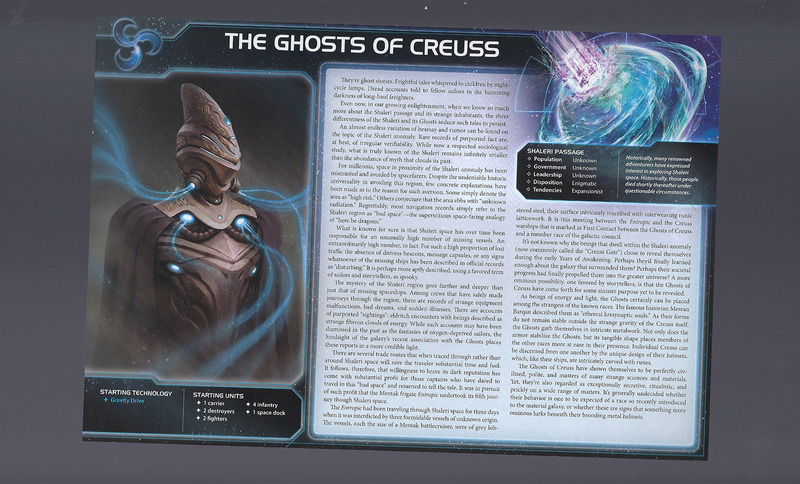 The Vorlons...errr Ghosts are an exception where their home system is off the board, connected to a special D wormhole system located where your home system would normally be located. The Ghosts get +1 movement moving out of their home system to compensate for this. Next step is galaxy map creation. Will need to be in front of my home computer tonight for that one. Are we creating the map together, or just going with one of the stock startups? I was thinking the stock setup on page 23 of the Learn to Play pdf. It's easy for new players to get screwed right at map setup with custom, or veteran players to get a big advantage. Though I have some reservations about the balance of the page 23 map. The starting locations with an unobstructed shot to Mecatol usually have an advantage (especially now that everyone gets VP off of it). I'll have to take a look at the neighboring systems they get to see if it compensates.